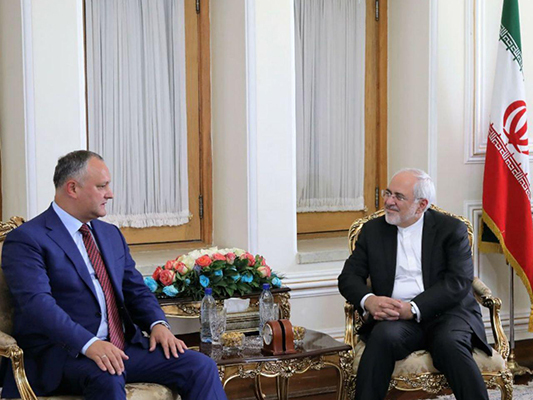 Iran’s Foreign Minister Mohammad Javad Zarif has held a meeting with President of Moldova Igor Dodon in the Iranian capital. In the Sunday afternoon meeting, the Moldovan president expressed his pleasure of being in Iran and participating in the swearing-in ceremony of President Hassan Rouhani. “In the last five months, I have travelled to your country for two times and I am happy about it. Accept my congratulations on the re-election of Dr Rouhani,” Dodon added. For his part, Zarif expressed his satisfaction with the Moldovan President’s attention to bilateral relations, saying the agricultural field is one of the areas where the two sides are interested in cooperation. Iranian foreign minister also noted that boosting banking collaborations will help in cooperation in other fields as well. Zarif stressed that culture, literature and communications could bring the views of the two countries closer. The two sides also talked about regional crises, fighting extremism, banking relationships, joint energy investment, launching refineries and cooperation at the international level.